Published: Dec. 30, 2018 at 05:25 p.m. Published: Dec. 30, 2018 at 05:12 p.m. Published: Dec. 9, 2018 at 01:44 p.m.
Baltimore Ravens running back Kenneth Dixon dives into the end zone for touchdown. 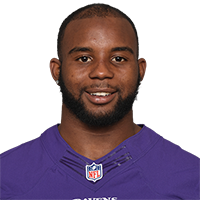 Published: Sept. 9, 2018 at 04:28 p.m.
Baltimore Ravens running back Kenneth Dixon finds his way through defenders for 2-yard touchdown.